Every day in February, the Magazine is featuring a classic public information film from the past 60 years, concluding with a vote to find the nation's favourite. In terms of simple but effective, Think Once, Think Twice, Think Bike is a classic. This short public information film, screened in 1975, asked road users to be considerate toward motorcycles at junctions. 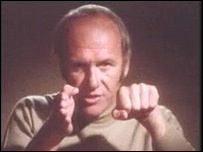 Presented by actor Edward Judd, it shows him punching his hand to inform people of the effect a car might have on a motorcycle. A move copied in playgrounds across the country for years afterwards. The film's classic status was confirmed when the satirical sketch show Not The Nine O'clock News did a parody of it, featuring Mel Smith, a cricket bat and various soft fruit. Man: If you imagine this is your car and then this is a motorcycle. Now when you drive up to a main road it's easy to see other cars. Man: But because a motorcycle is the third of a width of a car he's very hard to see. Man: But he's dead easy to hurt. Man: Nasty. That's why at junctions I'm asking you to give a second thought for bikes. Man: Stop, think once for cars. Hold it, then think again for bikes. If you want to avoid this. 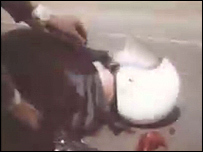 Man: Think once, think twice, think bike. Could you do better yourself? Here's your chance to try. The Magazine is inviting readers to make your own 60-second films. Your brief is to celebrate the art of the public information film. This means you can make a film which warns of modern danger in a contemporary style, or you can produce one in the style of films of old. It's up to you. You've got until the end of the month to make the film and get it to us. Instructions for sending them to us are at the bottom of the page. For those of you looking for tips on how to make your film work, BBC Video Nation editor Rosemary Richards says the key thing to consider is what the audience would like to see. Ms Richards says it's always best to get out to different locations and take lots of pictures so you can illustrate your film well - but don't overdo it. "Keep it simple," she says. "For example, you might want to use actors but perhaps your friends and family are not great actors. It might be best to just speak straight into the camera yourself. "You should also make sure you don't film your subjects next to windows and that you use the microphone(s) appropriately. And while hand-held camera can be used to good effect, it's usually best to make sure you have a good supply of steady shots. "However great your creative idea is, the film can't be used unless we can see and hear what's on it," she says. Also, if you want to get your film on the web or on TV, you must make sure all the work - including the music - is your own or copyright cleared. So keep it simple, make sure the images and sounds are clear and, of course, get a good story. Films should be 60 seconds maximum. Please submit your films to us via e-mail or by post. E-mail attachments should be sent to the.magazine@bbc.co.uk, subject line STOP LOOK LISTEN COMPETITION. Attachments should be no bigger than 10Mb - you may be able to compress the file by zipping it. If your film is above 10Mb, you can either upload it to your own personal webspace or free online storage sites (such as www.ourmedia.org) and send us an e-mail telling us its address. Alternatively you could use free online file transfer services - see this Creative Guy blog posting for a list of 50 such services). Again, please address these to the.magazine@bbc.co.uk, subject line STOP LOOK LISTEN COMPETITION. Terms and conditions If you submit an image, you do so in accordance with the BBC's Terms and Conditions. Remember the young ones version of this ad? think 'don't drive your car up on the pavement'"
The Think Once, Think Twice film may have been snappy and effective, but that hasn't stopped people pulling out in front of motorcycles, resulting in more Think Bike adverts recently. With the number of accidents caused by people driving too close to the car in front, my favourite would be: "Only a Fool Breaks The Two Second Rule", that being how far you should be behind the vehicle in front. I was worried this one would be forgotten! It is one of the most memorable because it is easy to send up. The Young Ones also parodied this film. With think once, think twice, think don't drive on the pavement. I think Andy De la Tour was the man in the roll neck jumper and he used a cricket bat with a brick nailed through it. Thirty-one years on we're still running more or less the same ad with the same minimal impact on driving. I can't think why you want to highlight this one as a success. Yes! At last! This was my favourite PIF. I'm not sure why, perhaps because it was really simple and stark, but got the message across very powerfully. And for years afterwards, I still did the thumping the palm gesture for all sorts of things.